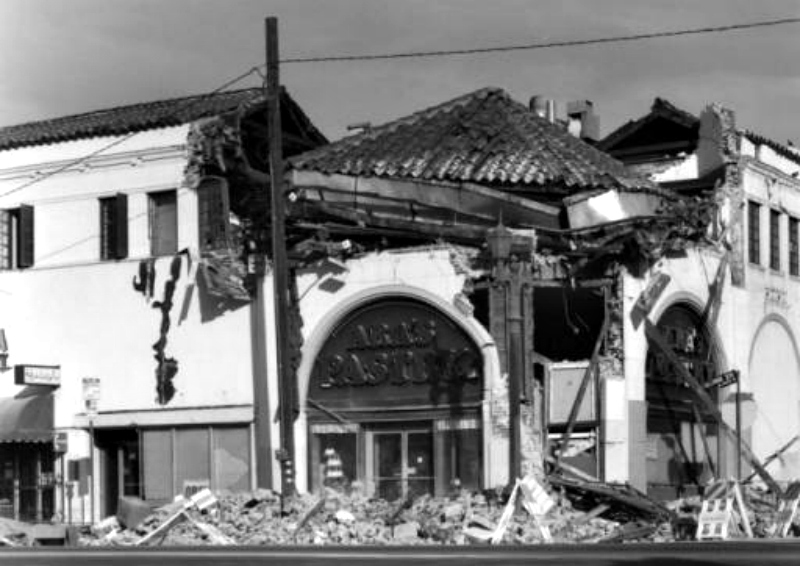 Are We Safer Than When the Northridge Earthquake Hit? At 4:31 on the morning of January 17, 1994, the Northridge Earthquake hit Southern California. The violent shaking came from a deep underground fault line that scientists had not yet identified, and shocks could be felt as far away as Las Vegas. The damage was worst in the San Fernando Valley, where portions of buildings and other structures collapsed. It was reported that 57 people died immediately from the temblor, though later data cited a count of 72, including heart attacks and other quake-related causes of death. Now, a quarter century later, we talked with Dr. Thomas Heaton, a professor of engineering seismology at the Caltech’s Seismological Laboratory, about what the Northridge quake revealed about our ability to survive a major seismic event–and which questions remain far from answered. How did the Northridge Earthquake in 1994 compare to prior California quakes? The San Fernando Earthquake, [which] happened back in 1971 and was almost a twin to the Northridge Earthquake, was magnitude 6.7 and in the northern part of the Valley. And then the Northridge Earthquake, magnitude 6.7, was in the northern part of the Valley. In the 1971 earthquake, there was a complete damage to the communication system, the telephones were all out, and nobody knew what really happened for about three hours in the heavily shaken areas where there were collapsed buildings. There was a partial failure of an important dam in that part of the Valley as well. If they hadn’t lowered the level of water in that dam just a few months before, the estimates are that it would have killed about 15,000 people. Instead, the death toll was about 56. By the time of the Northridge Earthquake, the dams were all being checked, so there were no similar issues. That was a big change. And we had designed our seismic systems so that we had much better information during the earthquake sequence. We knew within about 20 minutes where the most heavily shaken areas were and approximately what was going on. That helped coordinate emergency services. If that earthquake were to happen today and our systems work as intended, you would know about that earthquake before you even felt it because we have the seismic alerting system. The Shake Alert system is now in place, and that’s pretty much [a result] of the Northridge Earthquake. It’s important for all of us to remember, as terrifying as Northridge was, there were only 57 deaths. We haven’t really had an important earthquake in California since 1906. That one turned out radically different. The largest city in the Western United States, [San Francisco], was basically obliterated. If we have an earthquake in our future that wiped out an entire city like that, I don’t even know how we would react to it. Some people say, “Well, 1906 was primarily a fire,” but people who study fires acknowledge that there is still some chance that a major earthquake in the future could cause a massive conflagration that would take out an entire city. What should we have learned from the Northridge Earthquake about building for seismic safety? I would say the most important impact was the rather shocking discovery that welds being used to construct high-rise buildings at that time were systematically deficient. All of them were bad. It is kind of terrifying. There are different welding techniques in the newer buildings but, unfortunately, most of our buildings in the Western U.S. are older, and those have not been remedied. The only retrofitting program that has included this issue is one that was instituted by the city of Santa Monica. Northridge showed us that many of our tall buildings were not operating the way people assumed they were. It wasn’t that big of an earthquake. There were some papers written about how tall buildings fared in the Northridge Earthquake that recognized that if those buildings had been at the point of maximum shaking, we would have seen serious collapses. Now, at least if you read things I write, it says it’s plausible that we’ll have bigger earthquakes in Los Angeles that could collapse tall buildings downtown. Are buildings being constructed now safer than they were in 1994? People have this sense that our new tall buildings are being built for this “2,500 year” earthquake standard. 2,500 years is a long time. When the public hears that, it’s almost the same as saying “forever.” But I would tell you–I don’t think this is a consensus–but I would tell you those numbers are seriously flawed. They’re mainly advocated by developers and financiers. If people actually recognized that these buildings might not do so well in a future large earthquake, who would invest all that money in them? So they make those kinds of statements about 2,500 years. The life-and-death question is: Are you in a good building or not? But for an average citizen, there’s almost no way to tell. Even for those of us that are professionals, it’s tricky. But that’s really the key question. Because if there’s a big earthquake, but the buildings do fine, and they don’t burn up or whatever, it’ll be upsetting, but you’ll probably survive to have some really exciting stories to tell the grandchildren. If the building doesn’t do well, and collapses, you won’t have to worry about grandchildren. 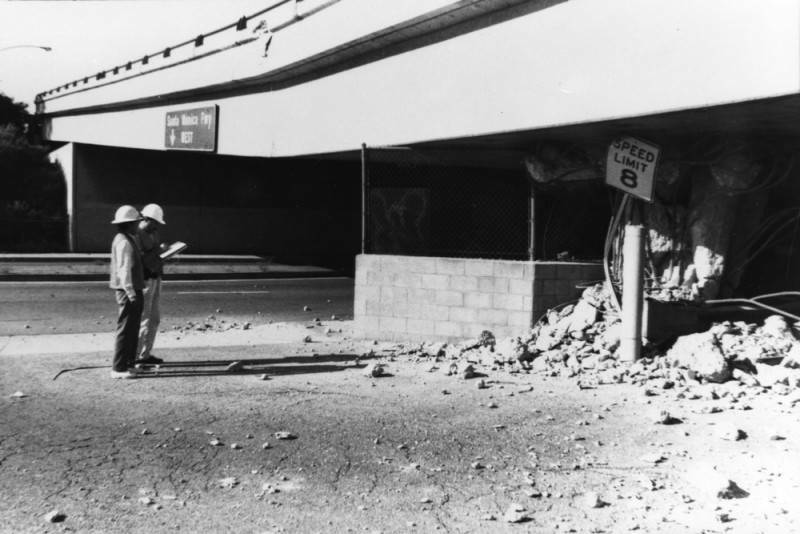 In the Northridge Earthquake, one of the major collapses was of the interchange of the 210, 5, and 15 freeways. What did officials learn after that structural failure? That freeway interchange was first constructed back in the early 1970s. While it was being constructed, there was the San Fernando Earthquake in ’71 and the interchange collapsed. When they rebuilt it, they rebuilt it the same way they were building it before. So when you get Northridge, which was basically a repeat of the San Fernando, the interchange collapsed again. Because it was such an important interchange and the people of the region decided they wanted those highways to be open, the state decided not to redesign the interchange. They rebuilt the interchange the same way again, the same way that collapsed the first two times. There was a program put into place, particularly after the Loma Prieta Earthquake in 1989, to retrofit all our freeway interchanges and bridges, and they were planning to upgrade that very interchange, but before they got around to it, we had Northridge. When they rebuilt it, they used the original plans, and then added the retrofitting after. Hopefully it works! Do we have any way to know when or where the next earthquake will happen? I’ve been in this business a long time. I got into this in 1972, when there was some hope that we would be able to predict earthquakes. In fact, there was a formal earthquake prediction program in the United States in the ‘70s. Now, I would say most earth scientists in the United States do not believe that earthquake prediction is a practical possibility. The Northridge Earthquake occurred on a fault that had not been recognized prior to the earthquake. And if that hadn’t occurred, I think we still would not recognize it. It’s on a deep fault system that you can’t see at the surface and I don’t think there is any way we would have recognized it even today. In my experience, roughly 50 percent of earthquakes happen on previously unknown faults. If we look at the rate at which strain is accumulating in this region, it’s accumulating energy faster than we’ve seen it radiated back out in earthquakes. There’s kind of an implication that the rate of earthquakes is not sufficient to keep up with plate tectonics. It begs our suspicion. I don’t think a really good scientist would be willing to say that we scientifically know that to be a fact, but it’s certainly what we suspect. Why do earthquakes in particular seem to capture so much of the public’s attention? Earthquakes are really difficult for humans to deal with because they’re all different and you don’t experience many earthquakes in your lifetime. If you’re lucky, you might never experience a big earthquake. If you do, it’s highly unlikely you’ll experience several of them. So when they happen, we tend to be very much taken by surprise. You’re living in some area where things have been relatively calm, focusing on the normal craziness of life, and then suddenly, everything around you changes state. You’re totally disoriented about what’s going on and what will happen next. It’s extremely stressful for human beings. Often when people go through these, and they really experience how violent the shaking of an earthquake can be if you’re right on top of it, people who have been through that often psychologically can’t deal with it. It’s amazing how many people, after the Northridge Earthquake and the San Fernando Earthquake, just decided to give up on California and move somewhere else.